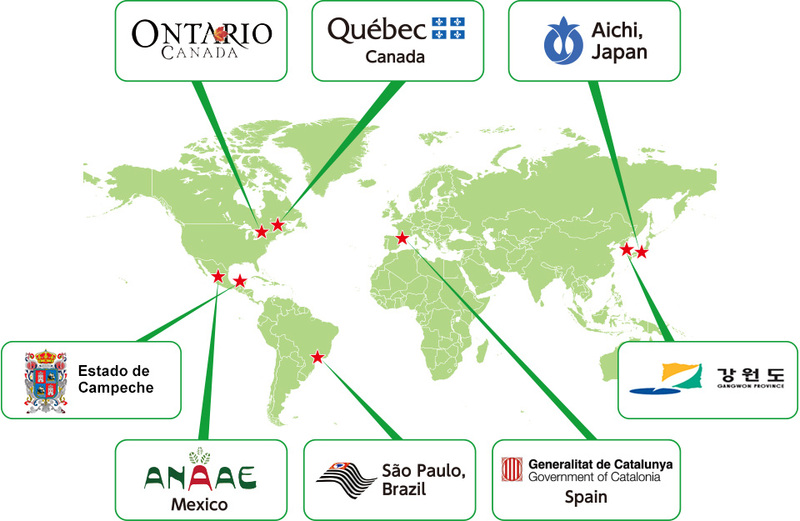 Aichi, ANAAE, Catalonia, Ontario, Québec and São Paulo have launched a new initiative called "Group of Leading Subnational Governments toward Aichi Biodiversity Targets" to contribute to reaching the Aichi Targets. We will enhance our own activities through sharing opinions on our measures and we will also promote actions of subnational governments for biodiversity by inviting them to our discussions and sharing lessons learned. Biodiversity is key to the well-being of humankind, for it provides us with food, clean air and water, and also helps to adapt to, and mitigate, the negative effects of climate change. However, it is endangered by various drivers including excessive exploitation of resources, pollution and rapidly changing climate. The Aichi Biodiversity Targets are the twenty substantial targets adopted, as a part of the Strategic Plan for Biodiversity 2011-2020, to improve the status of biodiversity at CBD COP10 held in Nagoya, Aichi in 2010. Achieving the Aichi Biodiversity Targets are also critical to the achievement of some of the United Nations’ Sustainable Development Goals. However, the Global Biodiversity Outlook 4 (GBO-4) concluded that although there has been significant progress towards meeting some components of the majority of the Aichi Biodiversity Targets, in most cases this progress will not be sufficient to achieve the targets set for 2020 and additional action is required to keep the Strategic Plan on course. Subnational governments, including States, Provinces, Regions and Prefectures, are the stewards of global ecosystems in microcosm, and have the potential to develop comprehensive efforts for the conservation of biodiversity as well as its sustainable use Their active contributions are essential to achieving the Aichi Biodiversity Targets. Subnational governments are also able to work with their respective national governments, ultimately responsible for achieving the Aichi Biodiversity Targets. At COP10, Decision X/22 endorsed the Plan of Action on Subnational Governments, Cities and other Local Authorities for Biodiversity 2011-2020, and the Advisory Committee on Subnational Governments (AC SNG) was established in April 2012 under the leadership of the Secretariat of the CBD in order to contribute to the implementation of this action plan. We will discuss those actions and lessons learned to enhance our measures toward conservation of biodiversity. Furthermore, we will be a driver in achieving Aichi Biodiversity Targets. To this aim, we call on subnational governments in the world to take part in our discussion and, building on the past activities of the AC SNG, apply the lessons learned into the implementation of each government’s actions to conserve biodiversity. We also encourage them to participate in international learning platforms for subnational governments including the Learning Platform Regions for Biodiversity led by The Network of Regional Governments for Sustainable Development (nrg4SD) and the Global Community for Local & Regional Action for Nature coordinated by ICLEI-Local Governments for Sustainability. Subnational governments can fulfill their potential under the efficient political frame set by the COPs and the appropriate development of policies by the Parties to the Convention. We call on the Parties to take measures to enhance the capacities of subnational governments and to better support subnational governments in implementing the CBD and achieving the Aichi Biodiversity Targets. We call on the secretariat of the Convention on Biological Diversity to continue their assistance in implementing the Plan of Action on Subnational Governments, Cities and other Local Authorities for Biodiversity 2011-2020. We are willing to support the efforts of the Parties, the Secretariat of the CBD and other critical players such as donors and financing mechanisms to the fullest extent possible in achieving these goals. Aichi adopted Aichi Biodiversity Strategy 2020 in 2013 and has developed the ‘Aichi Method’ to reach Aichi Target 1(Mainstreaming Biodiversity) and Target 5(Reducing the Habitat loss) and taken actions including asking developers to mitigate the negative impacts of constructions on biodiversity and establishing councils where citizens, municipalities, private companies, NGOs and educational institutions work together to create ecological networks. By the year of 2016, Aichi has completed to set up nine councils, which cover all part of prefectural area and include more than 220 organizations in total. The National Association of State’s Environment Authorities and its subnational states members work towards creating strategic alliances, cooperation and exchange of experiences between Government and Civil Society, that promotes the exercise of environment governance, as the seminal point from which we can create public policies that contribute to halt the degradation and loss of biodiversity, to ensure and protect ecosystems, the responsible use of our natural wealth and the fair distribution of environmental services, complying with the Aichi goals. The Ontario Biodiversity Council is a cross-sectoral body involving 34 organizations that guides implementation of Ontario’s Biodiversity Strategy and reports to the public on progress. Ontario’s strategy includes 15-time bound targets and aligns with the CBD Strategic Plan for Biodiversity 2011-2020 and the Aichi Targets. To assess progress on targets and provide a status on biodiversity, Council produces a State of Ontario’s Biodiversity report on a 5-year cycle using 45 indicators. The Ontario Ministry of Natural Resources and Forestry provides secretariat support to Council and leads government efforts under Biodiversity: It’s In Our Nature, Ontario Government Plan to Conserve Biodiversity 2012-2020. This government plan adopts the visions and goals of the strategy and guides actions across 15 government ministries. Quebec adopted two Biodiversity Strategies and Actions Plans during 1990s and 2000s, which were followed by the adoption of the Government Biological Diversity Guidelines in 2013. Those Guidelines represent an initial response to the Aichi Biodiversity Targets and set out seven guidelines to ensure that biodiversity is taken into account and incorporated into planning and implementation of actions undertaken by government ministries and organizations. In particular, Quebec has made ambitious commitments within two major governmental Strategies (the Plan Nord and the Maritime Strategy) to reach the Aichi Target 11 and protect, by 2020, 17% of its landmass and freshwater areas and 10% of its maritime zones. The State of São Paulo has had a strong presence in the biodiversity discussions since 1986, when the State Secretariat for the Environment was created. In 2011, the São Paulo Biodiversity Commission was established, approving the "São Paulo Action Plan 2011-2020“ towards the implementation of the Convention on Biological Diversity and, specifically, its Aichi Targets. Today, some of our main action fronts comprehend comprise enhancing the management of conservation units, increasing inspection to prevent illegal actions against the environment and developing an economic and environmental zoning to permit a truly sustainable development of our State. Campeche is at the beginning of State Biodiversity Strategy implementation; it was officially published since 2015. Campeche is celebrating 40 years of the State Protection and Conservation Program; it is the oldest program in Mexico and Campeche has the record for the highest number of turtles nesting in the country. Campeche signed in COP 13 a regional agreement for sustainability of the Yucatan Peninsula including rainforest effective management, sustainable tourism, water and ecosystems with goals to achieve in 2030 year. Also Campeche has the first ejido(land community) in Campeche certified by Forest Stewardship Council for forest sustainable management. Taking the opportunity of hosting the CBDCOP12, Gangwon Province developed a “Biodiversity strategy of Gangwon Province” in 2014 and, in collaboration with 18 local authorities, are currently implemented 67 projects included in the strategy. We have made significant progress in improving the status of biodiversity (Target11), such as the extended wetland protection areas since last year.Also, We are pushing ahead with ‘Olympic Winter Games’ which will be held in PyeongChang,Gangwon Province next year under a slogan of “Low Carbon and Green Olympics”. In particular, as a region with the most threatened species in Korea, we are proceeding with various projects to prevent the threatened species (Target12) and to restore ecosystems (Target15).